You are their first teacher! Not so long ago, most infants born into silence found little hope of ever being able to play a full role in family and community life. Now, with early diagnosis and advances in hearing technology, it is possible for children who are deaf and hard of hearing to grow up in a rich sound environment, learning to listen, talk and succeed in their life. But this possibility cannot become reality unless families receive expert help and support as soon as their child's hearing loss is detected. After having overcome the shock after knowing their child's condition, parents need help to overcome their despair, accept the condition and move forward in a positive way. Parents have to be aware that they have the potential to be the most effective teachers of their young deaf child, especially in the early pre-school years when most of the time the child is at home. The John Tracy Clinic in Los Angeles USA (www.jtc.org ), has helped children with hearing loss and their parents from all over the world develop the skills and confidence they need, including through the on-line Distance learning Program for Parents. "You Are Their First Teacher" is a compilation of excerpts from the "John Tracy Correspondence Courses for Parents of Young Deaf Children". This small compilation can be used as first information for parents at the time the child is diagnosed. Anyone is welcome to translate, adapt and use this information for their own needs. We advise centers and clinics to put in a list of addresses and contacts of hearing clinics, rehabilitation centers, institutions, pre-schools and special schools for the deaf in their area, that can provide further assistance to the parents. Communication is sharing information and feelings. Communications is always two ways, one is the listener, and one is the speaker. Your function as speaker is very important, but the function of the listener is also equally important. If you can be a good listener, you will also give your child the opportunity to be a good listener. The first step to increase the child's hearing potential is by letting the child wear the hearing aid as long as possible. At first, three times fifteen minutes each day is enough. Then you have to leave it on for five minutes longer every time, until at the end the child wears it the whole day. You also have to make sure that the hearing aid is working well. One thing you have to remember, never force your child to wear the hearing aid, because, once he rejects it, it will be difficult to persuade the child. If your child becomes a listener, your role is to always explain in words all the activities, and all happenings around him. The child needs a lot of repetitions, so they can understand and later pronounce it. Try to catch the child's attention. After that, give your response in form of spoken words accompanied by facial expressions, movements, signing as well as with the help of drawings. If your child becomes the speaker, your role is to give attention to whatever the child "says", try hard to understand as much as possible what the child is trying to say, and give your response in the form of speech and actions. Herewith the child will feel that to communicate will be beneficial, and the child will be motivated to communicate even more. When communicating, give the child a clear message. Facial expressions, pitch and intonation of voice, and your body movements will be a great help for your child. The child also needs approval and rewards, to increase understanding and learn to know the difference between good and bad. This will motivate the child even more. Learning should be through all the senses, especially eyes, ears, and tactile sensation. Because of the shortcoming in hearing, the child has to learn to lip read, which means to read the words from the lip movements of the speaker. 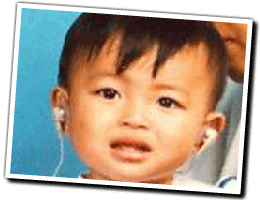 The child also needs to learn to listen to sounds and make maximal use of its hearing function. The function of tactile sensation through touch is to feel the vibrations of each sound or voice.